Bonnie Harder, D.C. treats people at Aspen Chiropractic Clinic in DeKalb, IL Monday, Tuesday, Wednesday, Friday, and comes to people’s homes, business, and stables to treat dogs, cats, and horses Thursday and Saturday by appointment. She commonly travels to areas near Freeport, Dixon, Rockford, Dekalb, St. Charles, Shabbona, Big Rock and Sugar Grove Illinois. She only charges an extra trip fee if the location is more than 50 miles away from Monroe Center, IL. Bonnie graduated from Palmer College of Chiropractic and is certified in animal chiropractic from the Healing Oasis Wellness Center and College of Animal Chiropractors, but is not a veterinarian and does not hold herself out as a veterinarian. 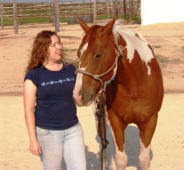 Prior to her chiropractic education, Bonnie graduated from the University of River Falls in Wisconsin with a bachelors of animal science, equine emphasis, and ag-business minor. After college she worked in the horse feed industry as an equine specialist for five years with Landmark Services Cooperative in Wisconsin designing commercial and custom horse feeds, balancing horse diets, and selling horse feed. She also became an AANHCP (Association for the Advancement of Natural Hoof Care Practitioners) certified hoof care practitioner while working in Wisconsin. During this time she learned the value of combining natural hoof care and equine chiropractic as well as the value of chiropractic for people and other animals from the clients she met and horses she worked with.